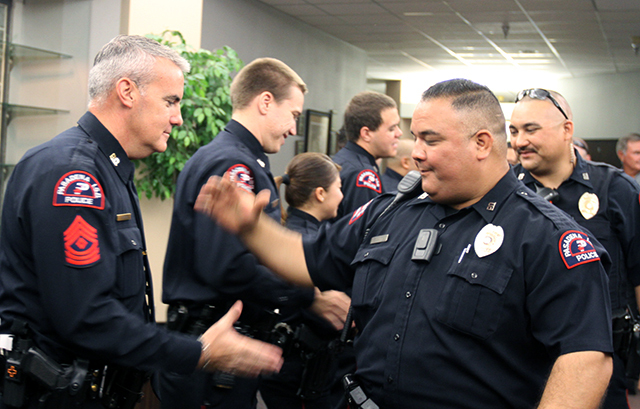 Pasadena ISD Board of Trustees, administrators, family and fellow law enforcement gathered, Monday, Aug. 24, to celebrate the promotion of two longtime police officers and the swearing in of five rookies. 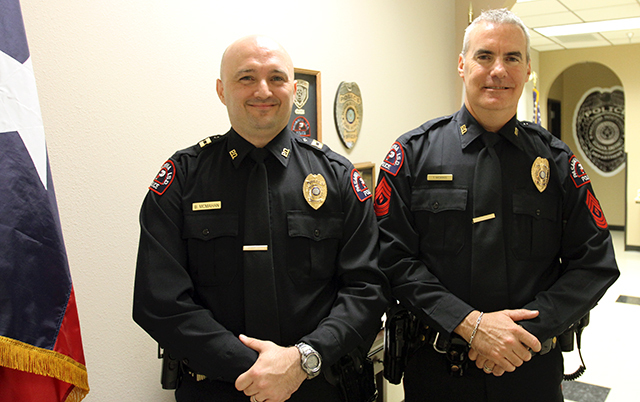 Bill McMahan was promoted to the rank of captain andTrae Morris was promoted to sergeant. 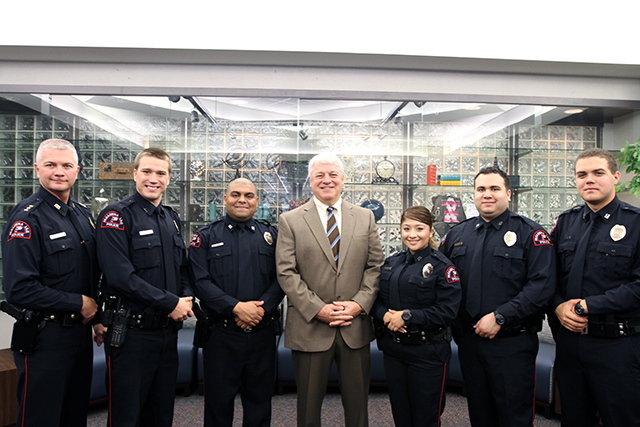 Austin Breese, Abraham Guajardo, Joanna Lopez, Manrique Portillo and David Reeves were sworn in as police officers. 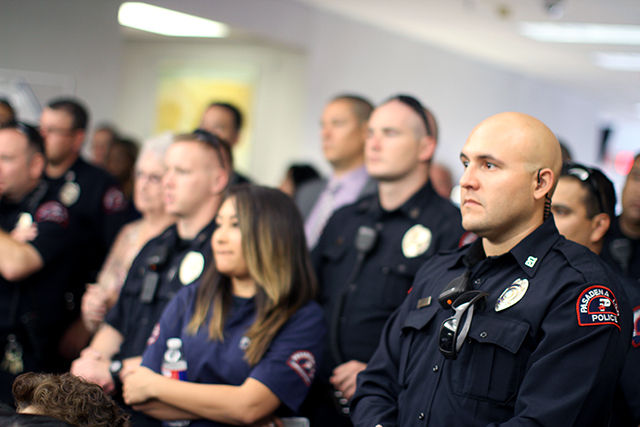 The new class members join nearly 40 police officers who help maintain a safe environment for students and staff in the district. 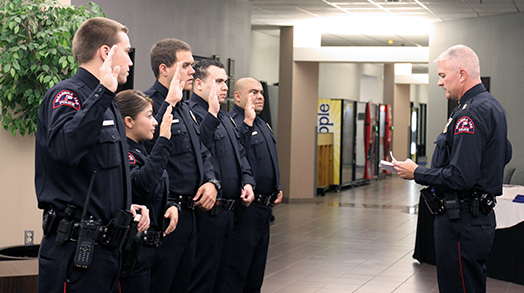 Each officer took an oath in front of the crowd symbolizing their commitment to protect the well-being and safety of Pasadena ISD students and members of the surrounding community. 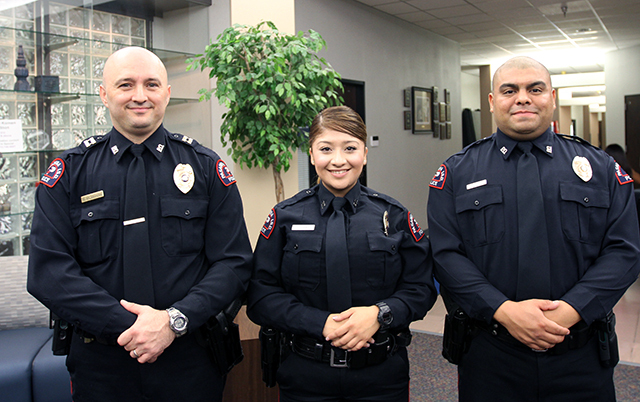 Making this an even more momentous occasion, three of the sworn in officers – McMahan, Lopez and Guajardo – are Pasadena High School alumni. 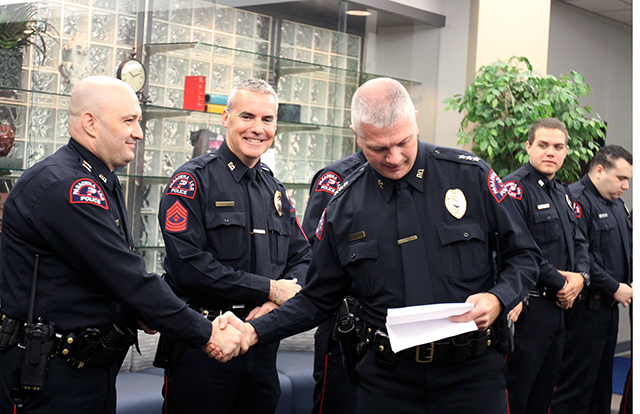 Captain Bill McMahan continues to rise through the ranks of the Pasadena ISD Police Department. The longtime Pasadena resident has served the district since 2002 as dispatcher, detective, sergeant and then administrative captain. 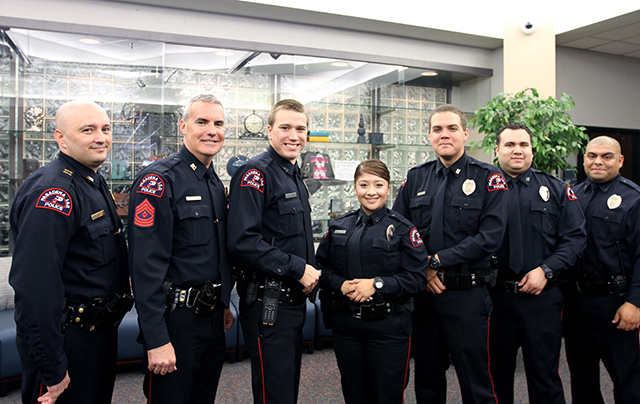 McMahan earned his Basic Certification in law enforcement from Houston Community College. He also holds a masters Peace Officer certification, Texas Commission on Law Enforcement (TCOLE) instructor certificate and serves as a field training supervisor. He was selected as the district Officer of the Year in 2009. A product of Pasadena ISD schools, McMahan credits some of his success to teachers who inspired him at Kruse Elementary, Jackson Intermediate and Pasadena High School. Formerly a detective for the district, Trae Morris was promoted to the rank of sergeant with the Pasadena ISD Police Department. Morris received his Basic Peace Officer certification from Houston Community College in 1993 and has served the district ever since. He has earned an array of certifications including: internal affairs, crime scene photography, blood stain pattern analysis, hostage negotiations and more. He has served as a K-9 handler and is currently assigned to patrol as a member of the Emergency Response Team and Bike Patrol. Morris is a licensed EMT and holds a Master Peace Officer certification along with a TCOLE instructor certificate. Morris has received numerous designations in his career including: Pasadena ISD Officer of the Year for 2005-06; Houston Community College Police Academy Top Cop; the National Police Canine Association award, where he was first place in explosives; and the Thompson Reuters “Everyday Heroes” award. He is a member of the Pasadena ISD Police Officers Association and served as president of the Texas Municipal Police Association. Morris said he is proud to serve the district in a new capacity this school year. “My responsibilities may be different, but my goals remain the same – to always uphold the law, make the best choices that ensure the safety of students and staff and treat all incidents of a serious nature,” Morris said. Detective Jason Grice will take Morris’ place this fall.